¶ Here is to be noted, that the Office ensuing is not to be used for any unbaptized adults, any who die excommunicate, or who have laid violent hands upon themselves. I AM the resurrection and the life, saith the Lord: he that believeth in me, though he were dead, yet shall he live; and whosoever liveth and believeth in me, shall never die. St. John xi. 25, 26. I KNOW that my Redeemer liveth, and that he shall stand at the latter day upon the earth And though after my skin worms destroy this body, yet in my flesh shall I see God : whom I shall see for myself, and mine eyes shall behold, and not another. Job xix. 25, 26, 27. The text in the 1892 Book is essentially identical and so is not given separately; any differences are indicated. 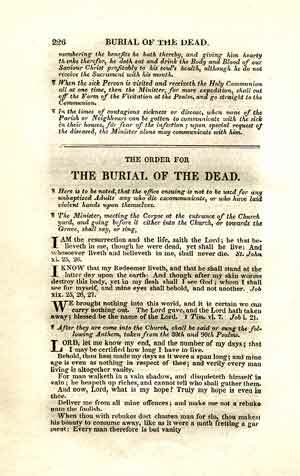 Page from the Burial service, from an edition published in 1843. ¶ After they are come into the Church, shall be said or sung the following Anthem, taken from the 39th and 90th Psalms. ¶ After they are come into the Church, shall be said or sung one or both of the following Selections, taken from the 39th and 90th Psalms. LORD, let me know my* end, and the number of my days; that I may be certified how long I have to live. Behold, thou hast made my days as it were a span long, and mine age is even as nothing in respect of thee; and verily every man living is altogether vanity. For man walketh in a vain shadow, and disquieteth himself in vain; he heapeth up riches, and cannot tell who shall gather them. And now, Lord, what is my hope? Truly my hope is even in thee. Deliver me from all mine offences; and make me not a rebuke unto the foolish. Hear my prayer, O Lord, and with thine ears consider my calling; hold not thy peace at my tears: For I am a stranger with thee, and a sojourner, as all my fathers were. Lord, thou hast been our refuge, from one generation to another. Before the mountains were brought forth, or ever the earth and the world were made, thou art God from everlasting, and world without end. Thou turnest man to destruction; again thou sayest, Come again, ye children of men. For a thousand years in thy sight are but as yesterday; seeing that is past as a watch in the night. As soon as thou scatterest them they are even as a sleep and fade away suddenly like the grass. In the morning it is green, and groweth up; but in the evening it is cut down, dried up, and withered. For we consume away in thy displeasure; and are afraid at thy wrathful indignation. Thou hast set our misdeeds before thee; and our secret sins in the light of thy countenance. For when thou art angry, all our days are gone: we bring our years to an end, as it were a tale that is told. The days of our age are threescore years and ten; and though men be so strong that they come to fourscore years, yet is their strength then but labour and sorrow; so soon passeth it away, and we are gone. * 1892 BCP only; the 1892 Book divides the anthem at this point. So* teach us to number our days, that we may apply our hearts unto wisdom. As it was in the beginning, is now, and ever shall be, world without end. Amen. "O" in 1892 BCP. ¶ Then shall follow the Lesson, taken out of the fifteenth Chapter of the first Epistle of St. Paul to the Corinthians. NOW is Christ risen from the dead, and become the first-fruits of them that slept. For since by man came death, by man came also the resurrection of the dead. For as in Adam all die, even so in Christ shall all be made alive. But every man in his own order: Christ the first-fruits; afterward they that are Christs, at his coming. Then cometh the end, when he shall have delivered up the kingdom to God, even the Father; when he shall have put down all rule, and all authority, and power. For he must reign, till he hath put all enemies under his feet. The last enemy that shall be destroyed is death. For he hath put all things under his feet. But when he saith, all things are put under him, it is manifest that he is excepted, which did put all things under him. And when all things shall be subdued unto him, then shall the Son also himself be subject unto Him that put all things under him that God may be all in all. Else what shall they do which are baptized for the dead, if the dead rise not at all? Why are they then baptized for the dead? and why stand we in jeopardy every hour? I protest by your rejoicing, which I have in Christ Jesus our Lord, I die daily. If after the manner of men I have fought with beasts at Ephesus, what advantageth it me, if the dead rise not? let us eat and drink, for tomorrow we die. Be not deceived: evil communications corrupt good manners. Awake to righteousness, and sin not; for some have not the knowledge of God. I speak this to your shame. But some man will say, How are the dead raised up? and with what body do they come? Thou fool! that which thou sowest is not quickened, except it die. And that which thou sowest, thou sowest not that body that shall be, but bare grain, it may chance of wheat, or of some other grain. But God giveth it a body as it hath pleased him, and to every seed his own body. All flesh is not the same flesh; but there is one kind of flesh of men, another flesh of beasts, another of fishes, and another of birds. There are also celestial bodies, and bodies terrestrial; but the glory of the celestial is one, and the glory of the terrestrial is another. There is one glory of the sun, and another glory of the moon, and another glory of the stars; for one star differeth from another star in glory. So also is the resurrection of the dead. It is sown in corruption; it is raised in incorruption: it is sown in dishonour; it is raised in glory: it is sown in weakness; it is raised in power: it is sown a natural body; it is raised a spiritual body. There is a natural body, and there is a spiritual body. And so it is written, The first man Adam was made a living soul; the last Adam was made a quickening spirit. Howbeit, that was not first which is spiritual, but that which is natural; and afterward that which is spiritual. The first man is of the earth, earthy: the second man is the Lord from heaven. As is the earthy, such are they also that are earthy: and as is the heavenly, such are they also that are heavenly. And as we have borne the image of the earthy, we shall also bear the image of the heavenly. Now this I say, brethren, that flesh and blood cannot inherit the kingdom of God; neither doth corruption inherit incorruption Behold, I show you a mystery: we shall not all sleep, but we shall all be changed, in a moment, in the twinkling of an eye, at the last trump: for the trumpet shall sound, and the dead shall be raised incorruptible, and we shall be changed. For this corruptible must put on incorruption, and this mortal must put on immortality. So when this corruptible shall have put on incorruption, and this mortal shall have put on immortality; then shall be brought to pass the saying that is written, Death is swallowed up in victory. O death, where is thy sting? O grave, where is thy victory? The sting of death is sin; and the strength of sin is the Law. But thanks be to God, which giveth us the victory through our Lord Jesus Christ. Therefore, my beloved brethren, be ye steadfast, unmoveable, always abounding in the work of the Lord, forasmuch as ye know that your labour is not in vain in the Lord. ¶ Here may be sung a Hymn or an Anthem; and, at the discretion of the Minister, the Creed, and such fitting Prayers as are else where provided in this Book, may be added. MAN, that is born of a woman, hath but a short time to live, and is full of misery. He cometh up, and is cut down, like a flower; he fleeth as it were a shadow, and never continueth in one stay. Thou knowest, Lord, the secrets of our hearts; shut not thy merciful ears to our prayer; but spare us, Lord most holy, O God most mighty, O holy and merciful Saviour; thou most worthy Judge eternal, suffer us not, at our last hour, for any pains of death, to fall from thee. FORASMUCH as it hath pleased Almighty God, in his wise providence, to take out of this world the soul of our deceased brother, we therefore commit his body to the ground; earth to earth, ashes to ashes, dust to dust; looking for the general Resurrection in the last day, and the life of the world to come, through our Lord Jesus Christ; at whose second coming in glorious majesty to judge the world, the earth and the sea shall give up their dead; and the corruptible bodies of those who sleep in him shall be changed, and made like unto his own glorious body; according to the mighty working whereby he is able to subdue all things unto himself. I HEARD a voice from heaven, saying unto me, Write, From henceforth blessed are the dead who die in the Lord: even so saith the Spirit; for they rest from their labours. Rev. xiv. 13. 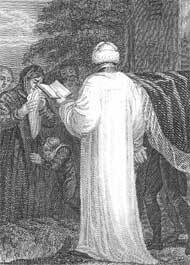 ¶ Then the Minister shall say [the Lords Prayer]*. Burial, from an 1810 English Book of Common Prayer. ¶ Then the Minister shalt say one or both of the following Prayers, at his discretion. ALMIGHTY God, with whom do live the spirits of those who depart hence in the Lord, and with whom the souls of the faithful, after they are delivered from the burden of the flesh, are in joy and felicity; We give thee hearty thanks for the good examples of all those thy servants, who, having finished their course in faith, do now rest from their labours. And we beseech thee, that we, with all those who are departed in the true faith of thy holy Name, may have our perfect consummation and bliss, both in body and soul, in thy eternal and everlasting glory; through Jesus Christ our Lord. Amen. O MERCIFUL God, the Father of our Lord Jesus Christ, who is the resurrection and the life; in whom whosoever believeth, shall live, though he die; and whosoever liveth, and believeth in him, shall not die eternally; who also hath taught us, by his holy Apostle Saint Paul, not to be sorry, as men without hope, for those who sleep in him; We humbly beseech thee, O Father, to raise us from the death of sin unto the life of righteousness; that, when we shall depart this life, we may rest in him; and that, at the general Resurrection in the last day, we may be found acceptable in thy sight; and receive that blessing, which thy well-beloved Son shall then pronounce to all who love and fear thee, saying, Come, ye blessed children of my Father, receive the kingdom prepared for you from the beginning of the world. Grant this, we beseech thee, O merciful Father, through Jesus Christ, our Mediator and Redeemer. Amen. MOST merciful Father, who hast been pleased to take unto thyself the soul of this thy servant [or this child]; Grant to us who are still in our pilgrimage, and who walk as yet by faith, that having served thee with constancy on earth, we may be joined hereafter with thy blessed saints in glory everlasting; through Jesus Christ our Lord. Amen. O LORD Jesus Christ, who by thy death didst take away the sting of death; Grant unto us thy servants so to follow in faith where thou hast led the way, that we may at length fall asleep peacefully in thee, and awake up after thy likeness; through thy mercy, who livest with the Father and the Holy Ghost, one God, world without end. Amen. ALMIGHTY and everliving God, we yield unto thee most high praise and hearty thanks, for the wonderful grace and virtue declared in all thy saints, who have been the choice vessels of thy grace and the lights of the world in their several generations; most humbly beseeching thee to give us grace so to follow the example of their stedfastness in thy faith, and obedience to thy holy commandments, that at the day of the general Resurrection, we, with all those who are of the mystical body of thy Son, may be set on his right hand, and hear that his most joyful voice: Come, ye blessed of my Father, inherit the kingdom prepared for you from the foundation of the world. Grant this, O Father, for Jesus Christ's sake, our only Mediator and Advocate. Amen. ¶ Inasmuch it may sometimes be expedient to say under shelter of the Church the whole or a part of the service appointed to be said at the Grave, the same is hereby allowed for weighty cause. At the Burial of the Dead at Sea. We therefore commit his body to the deep, looking for the general Resurrection in the last day, and the life of the world to come, through our Lord Jesus Christ; at whose second coming in glorious majesty to judge the world, the sea shall give up her dead; and the corruptible bodies of those who sleep in him shall be changed, and made like unto his glorious body; according to the mighty working where by he is able to subdue all things unto himself.